This recipe comes from a memory of a taste and of a Mongolian? Chef (from the banner behind him I think it is Inner Mongolia). Yesterday I made Uzbek samsa, a baked dough filled with spinach, and it reminded Jan of the Uyghur lamb samsa we had in Kashgar in 1988. I know the name Uyghur looks frightening to American sensibilities, but it is pronounced “Way-ger.” We were taking our vacation, from teaching English to the Chinese, to the far west of China. There were almost no foreigners in China during those months so, except for a few stray Canadians and Australians, we had Xinjiang pretty much to ourselves (not counting several million locals). 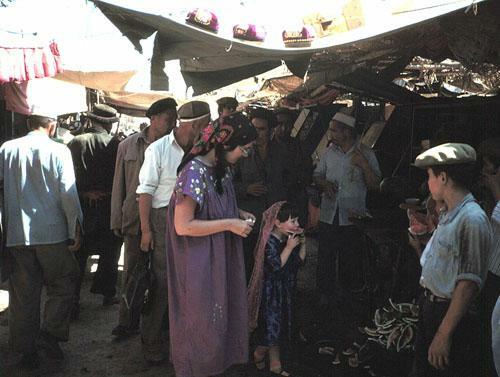 The locals assumed that we were Canadians, except for the one who thought I was a Russian and the woman who came up to Jan and started chatting her up in Uyghur. She could have easily passed in the Mexican embroidered dress and the Russian babushka she was wearing. Kashgar is a fascinating city in the middle of an arid desert and most definitely not what an American would think of as Chinese. 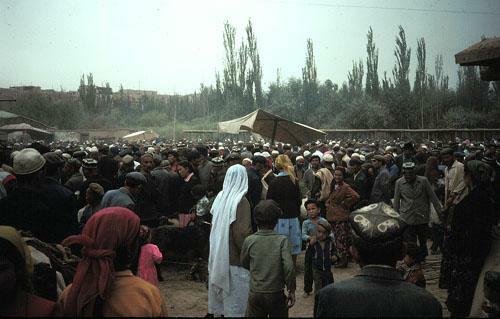 The Sunday market in Kashgar is the experience of a lifetime. A sleepy little town of a “mere” 100 thousand people becomes a beehive of 200 thousand buyers and sellers overnight. One of the street foods that were relatively safe to eat was the lamb samsa, which were sold right out of the oven. Although, at the time, we did not know what they were called, we just knew that they were delicious. 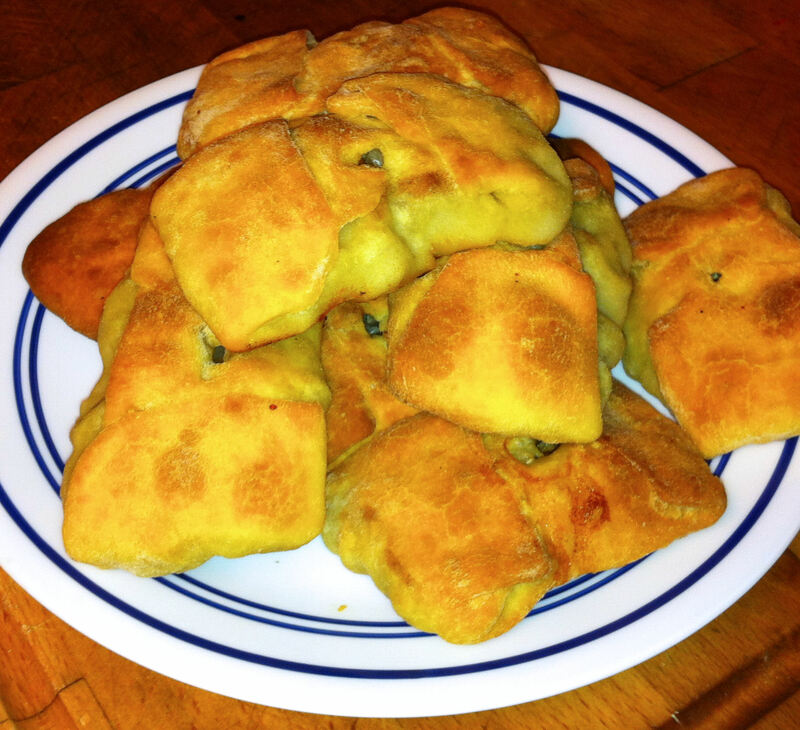 I have successfully replicated the Central Asian naan, which was one of the other staples of that trip. I have never attempted to make the samsa, but with my memory jogged, tonight I will make the attempt. In scanning the recipes on-line it seems to be important to either chop or course grind the lamb yourself. Store ground lamb is too fine a texture and will turn into a meat lump inside the dough, not the succulent bits of seasoned meat that it should be. Note: As we were having leftover samsa with our Chicken Casablana Soup, Jan told me that she though there was not enough cumin to match the flavor of the original samsa that we had in Kashgar. I, also, did not think there was enough lamb in them. I am making a few changes here for the next time I make this dish by boosting the spices and meat. Note 2: I have baked samsa both fold up and fold down now and I have decided that I am a Folddowndian. 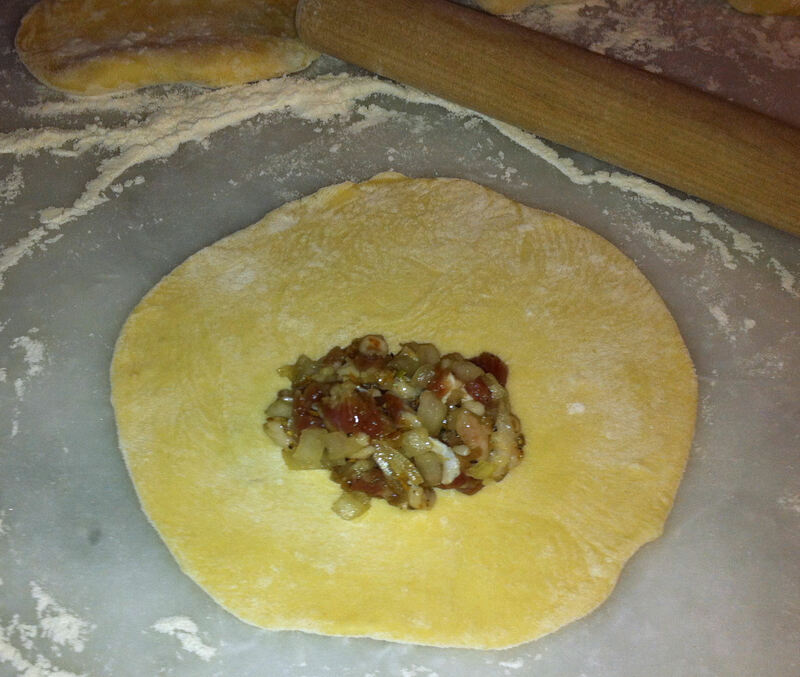 The folded side has more dough and this gets more thoroughly cooked in contact with the the baking sheet. When the thin side is down this dough gets over cooked. 1. Combine the all purpose flour, eggs, salt and water and knead to make the dough. Cover it with plastic wrap and let it rest for 30 to 40 minutes. Tip: This video clearly shows the steps in making samsa, even if you do not understand Mongolian. 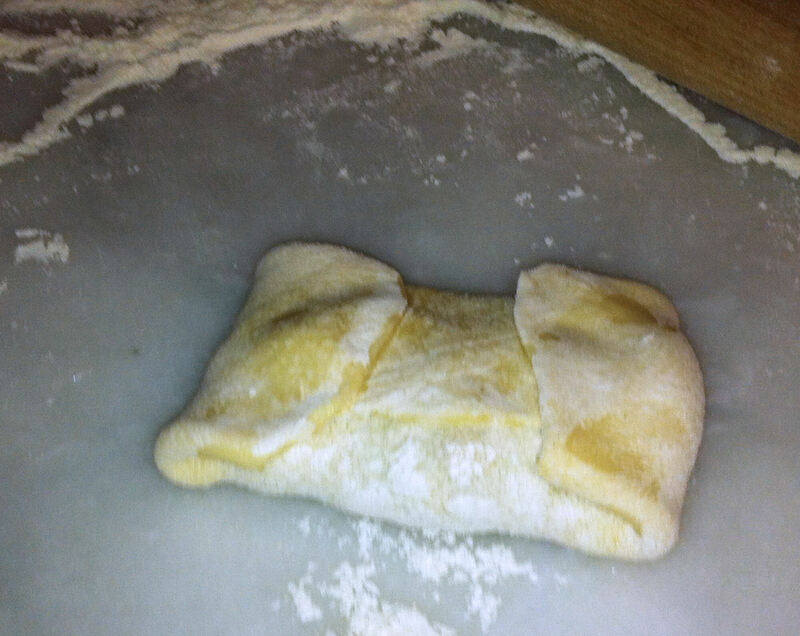 The chef also shows some alternate folding patterns, beyond a simple rectangle. 2. Remove the silver skin and large chunks of fat from the lamb, and chop the meat into small bits, but not too fine. 3. Take two tablespoons of the lamb fat and mince it very fine. Add it to the bowl of lamb. You need some fat to keep the meat moist, but if there is too much the samsa will be greasy and soggy. Discard or reserve the rest for other uses. 4. Chop the onion fine and mince the garlic. Add them to the bowl. 5. Toast the cumin and coriander for one minute in a dry skillet. Grind them to a powder and add them to the bowl. 6. Add the pepper, salt and water to the bowl and mix thoroughly. The water helps steam the meat. 7. 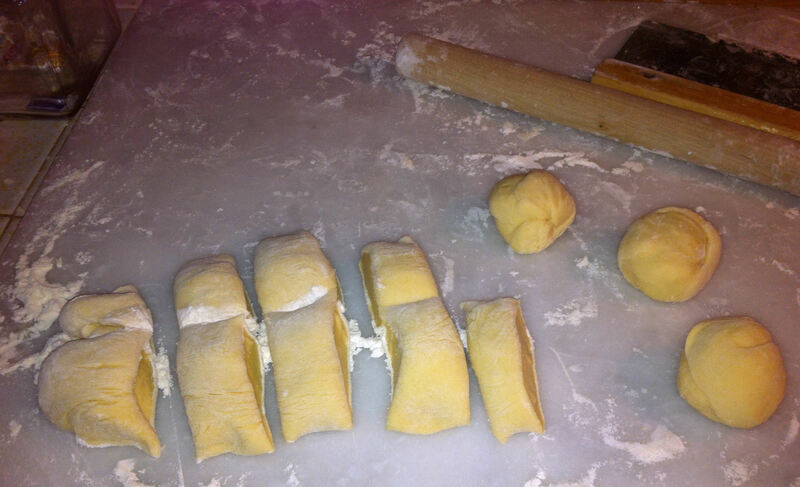 Divide your dough in half and roll each half into a snake about a foot long. 8. Cut the each snake into 10 equal pieces and roll them into small balls. 9. Roll out each ball into a 6 inch round disk. 10. Place about 3-4 Tbs. 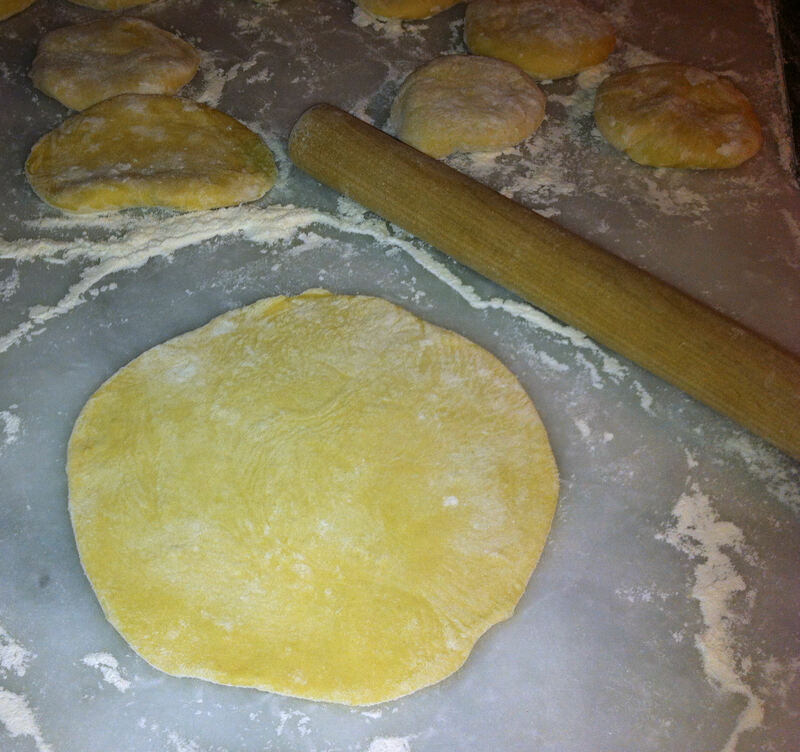 in the center of a dough disk. 11. 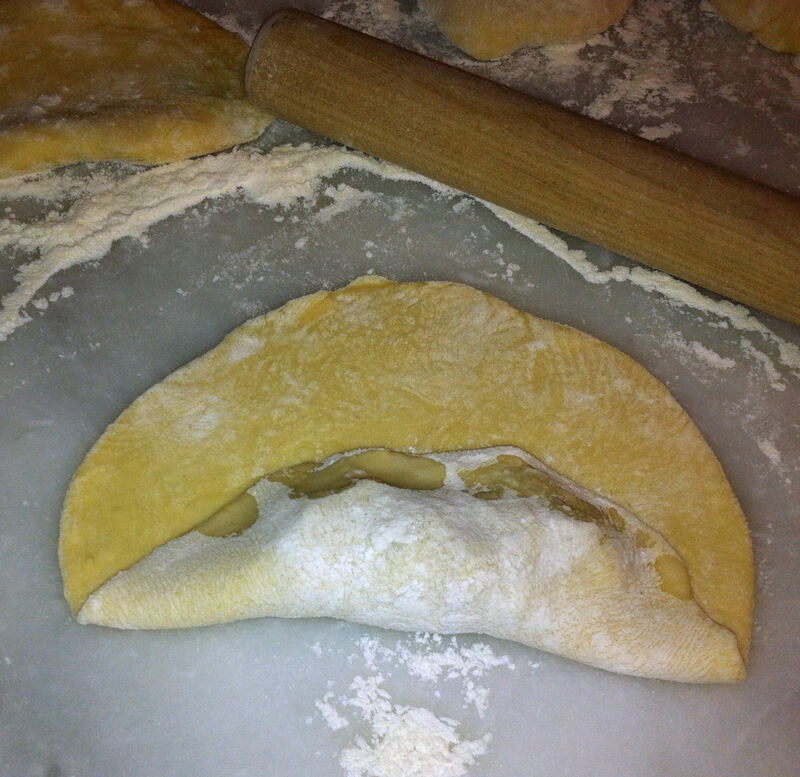 Fold one edge over the filling and moisten the top edge of the fold. 12. Fold the opposite edge over the first. Pat it down lightly. 13. 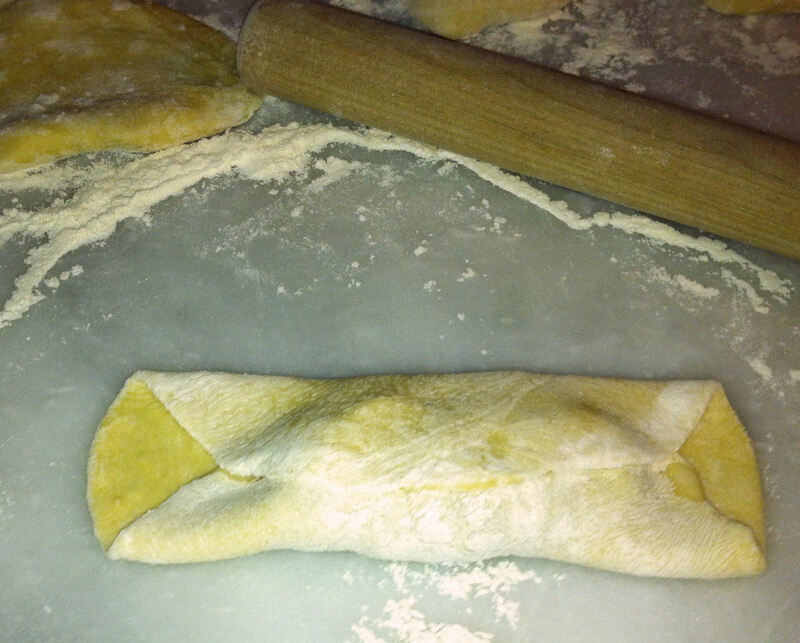 Moisten the open ends of the dough packet and fold each end in by a quarter of its width. 14. 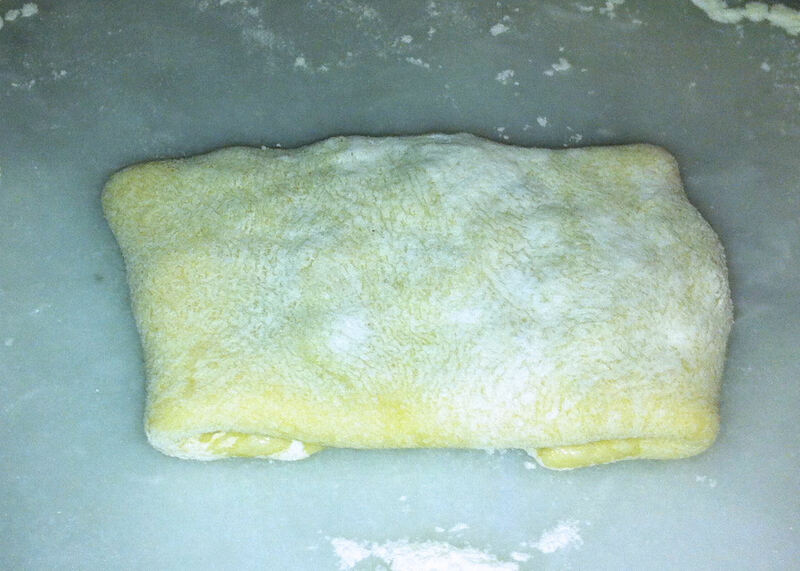 Turn it over and press lightly to distribute the filling into the corners and to seal the folds. 15. 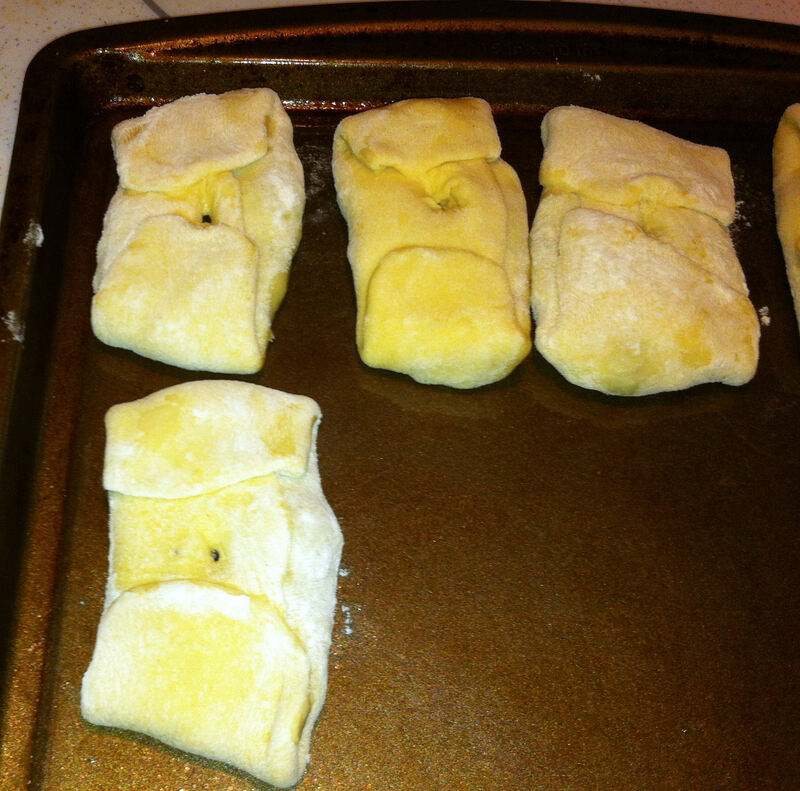 Lay the rectangular packet on a Pam-ed baking sheet. There seems to be a Lilliputian debate about whether the folds should be up or down. Poke a hole in the top of each packet to let the steam escape or it will blow up like a balloon. 16. When all of the packets are filled, brush lightly with oil. 17. Bake in a 400° oven for 35 minutes (check at 25 minutes to make sure that they do not get over done).